I had to make a trip to Richfield to get some work done. The drive was beautiful, though cold. Just outside of Cedar City, when the rain turned to snow, I cursed myself for assuming the weather would be mild everywhere. With just a flannel on I thought, “Well, hopefully if I break down or anything goes wrong, I will be near a town.” Most of the drive is through public lands, open and undisturbed for miles and miles. It’s beautiful and makes the drive enjoyable. When we got to Richfield we drove up and down Main Street looking for a suitable place to eat lunch. 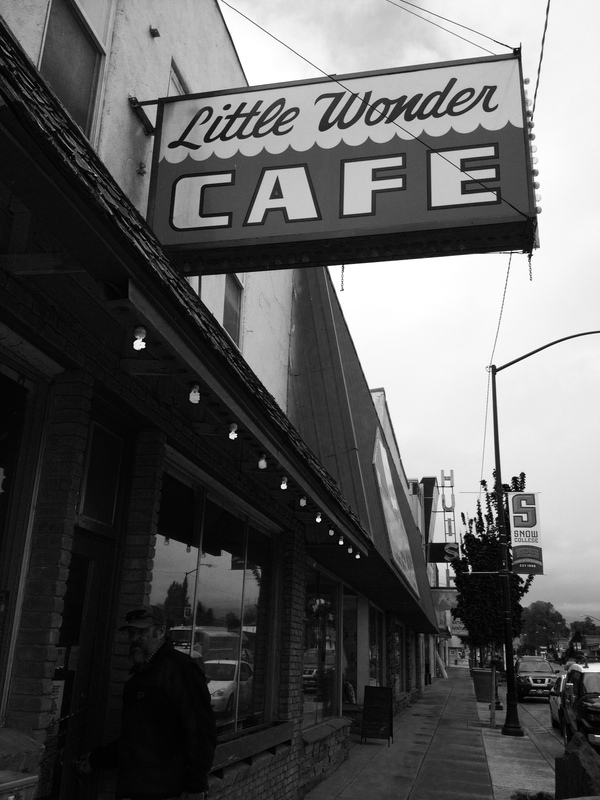 We settled on Little Wonder Cafe. It is a cute throw back cafe. The food is typical cafe fare; not great but not bad. As I ate I stared out the window and wondered what makes Utah towns so different than other ones. There are many small towns in the country, but Utah has its own flavor. One of the disconcerting realizations I had was that there is nothing for outsiders in them. There is no reason to stay in the town. Many people end up in small Utah towns because they are trying to get to some place beautiful: Bryce Canyon, Canyonlands, you name it. But the sad part is that there is no reason to stay in any of the towns, there is nothing there for you. And so, travelers grab a hotel room, a bite to eat, and pass through without looking back when they leave. I thought of other small towns that I had passed through, that are etched in my memory because they were cool – they were enjoyable. Two towns that stick out in my mind are Bishop California and Durango Colorado. I would go back to those towns as much as I would go back for the outdoor recreation that had drawn me there in the first place. They had bars, pubs, bustling coffee shops, and entertainment. At the end of the day, you can grab a few drinks and talk with the locals and other tired travelers; the social aspect that warms your heart and leaves good and lasting memories. You don’t feel like an outsider when you visit, even though you are. In Utah, where the majority of the population does not drink, there seems to be a mentality of assuming that if people want to go to a pub, they just want to get drunk. Of course we all know that getting drunk is a by product of drinking too much, but what this mentality ignores is that people want to enjoy drinks and food and friends like adults; that it is the social aspect they are looking for. Germans seem to get that concept with their biergartens, the French with their cafes, the Greeks with their open bars and restaurants. People are social creatures. After mountain biking, climbing, or hiking all day, people want to decompress and relax. What you largely get in most Utah towns is a smattering of restaurants that don’t serve alcohol and your hotels. Your entertainment is up to you and more often than not if you want a good time, you must track down a liquor store (if you can find it, because there is only one), get your alcohol and sip it in bed while flipping channels. If the hotel has a hot tub, your options might be a little better. Either way, there is no reason to stay longer than you must. It’s unfortunate. Because most of these towns are tourist towns, it’s surprising that they would not offer these sorts of amenities to travelers; it makes the tourists happy and the locals make more money. As it stands, apart from Salt Lake City, Park City, and Springdale, the prevailing message seems to be: give us your money and get going. It is an unfortunate message not just for the tourists, but for the state of Utah, as tourism and recreation bring in millions of dollars annually. When I engage in conversations with people angry over public lands and the loss of jobs and the economy, I can’t help but think of these towns and how there is no draw to them for the traveler and think, little wonder. In light of this, it is clear that people come to Utah for the land, not the towns, the people or the culture. Can you imagine if the same government who controls our alcohol consumption controlled our public lands? Is it so far fetched to believe that the people who won’t allow pubs would also put our lands off limits? Can you imagine if the places you love to go hunting, hiking, climbing, mountain biking, or canyoneering were suddenly beholden to the state, an individual, or a corporation? What if they charged Disneyland prices? What if they were suddenly off limits? Do you really believe the state would make better owners than the federal government? At least the federal government has to be fair and our taxes pay for our use. It is not hard to make the connection that the government overreaching into our private consumption choices would act in the same manner managing our lands. Posted on May 9, 2014, in Health & Wellbeing and tagged bishop california, durango colorado, overbearing government, overreaching government and public land, Richfield Utah, small towns, small wonder cafe, tourist towns, utah liquor laws, utah towns. Bookmark the permalink. 5 Comments. You do great works. I’m a fan. Btw I was there at the Bundy mess with the government. Not an employee. I’m a livestock broker. Background in commerce and livestock law. Thank you James. I’d love to talk to you sometime. I saw that you listed a number, is that a good number to reach you? Drop me an email sometime. While I toured south Utah, I noticed many small towns lacked cafes and taverns. Moab was only decent place for drinks and food in many miles. I think you hit the proverbial nail on the head. But maybe they don’t want folks to stay just because the new folks would bring in new ideas,attitudes, and beliefs. They may like the exclusivity of their homes.